We are grateful that Headup Games and GamersGate sent us this game to review! 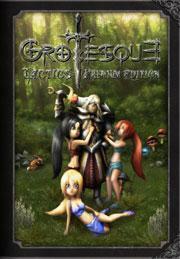 Grotesque Tactics: Evil Heroes Premium Edition is a fairly streamlined strategy RPG with a unique twist – it focuses on making fun of the RPG (Role-Playing Game) genre by parodying many common elements found in it. It all starts with Drake, the main character, having suicidal thoughts after failing to defeat a wild mushroom during training for the army. Being rather depressed, he considers ending it all by throwing himself to be devoured by another nearby ferocious mushroom. Meanwhile, two other soldiers, who were recently defeated by the “Dark Church”, are also considering ending their lives in a similar way; the army they were a part of was just defeated, and they are the sole survivors. During this drab debate the nearby demigod, Holy Avatar, indeed \'his semidivine humble self\' (as he calls himself), arrives to announce that he has found his favorite light being. Mishearing Drake\'s name, he calls him Cake, and tells him that he is going to help save the world. After first getting Drake out of his depression, he explains that nearby treasure chests are more important than helping people in distress. The two then go to save the first maiden (a young virgin wearing only tattered clothes) from her captors in an effort to build an army to take on the Dark Church and save the world from their evil enslavement. The story in this game is quite something in that it\'s fairly well written and really funny at times. They do a good job of poking fun at stereotypes in games and other things. Drake is the reluctant, \'emo\' hero. Holy is the world famous hero who somehow had his power reset to level one before you met him. Rukel is the goblin thief, and Mandy, Candy, and Sandy are the three maidens who use bows. Angelina is the angel healer, and Solithaire is a vampire sorceress. While not every game has all of these things, the archetypes are clearly established in the RPG genre. When I saw that they even had cosplayers of Holy Avatar, I just had to laugh out loud. Not all of the humor is clean (as you may have guessed) and most of it is definitely for adults only. Even then, discretion is advised; more on that later. In chess, a grotesque is a problem where one side, usually White, is vastly outnumbered and should face certain defeat, and yet can still come out victorious. Grotesques are generally intended to be humorous, as is the case here – humorous, but also tactical. The style of this game is reminiscent of strategy RPGs (SRPGs) like Final Fantasy Tactics, King\'s Bounty, and others. Like many of those games, it is a 3D isometrically viewed game where all movement takes place on a game grid. Even movement through town takes place similarly. You click to move where you want to go, or use the arrow keys as well. You control Drake, and the rest of the party follows you as you walk around. This generally works fine, though you can\'t pick the order of the party for upcoming battles. You can see your opponents sitting there, and as you walk towards them battle begins. Characters with the highest dexterity go first, and depending on their movement score, can walk to any unoccupied square within a certain distance. Every character has a direct attack, and for everyone except for some of the women, you must be right next to your opponent to hit them. Since the grid is square based, you can\'t attack from a diagonal. Most characters also have a special attack that allows them to attack opponents at a distance or do special damage to them at a cost of magic points (MP). Some of these attacks cause status effects, like injury, poison, blindness, or depression. Others are ranged or area of effect attacks. Depression is used to humorous effect occasionally as a storytelling device. Each character also has an \'obsession\' that can be triggered with certain conditions in battle. For example, Drake can make these motivating \'Braveheart\' speeches that powers up everyone in the party nearby, but after a time depresses him. Holy Avatar puts everyone in range to sleep with his boring stories of previous wars, and the maidens jealously attack anyone near Holy (friend or foe) because it\'s their job to protect him. As they gain levels, they get up to two special powers each. These powers are predetermined; there is no character customization here. There is very little customization in general in this game. As I said before, each character only gets two special attacks. Also, there are no more than five or six possible weapons or suits of armor per character, and there is never a reason to keep the old equipment when you get the new stuff. The only real customization available is a decoration slot that you can put special items in. Items in this slot can give you everything from additional HP to improved attack or movement. As characters gain levels they gain various attribute bonuses, which you also don\'t have any control of. There is also very little exploration in Grotesques Tactics: Evil Heroes, and a surprisingly linear game play experience. As the story progresses, you are whisked away to a particular location, and you can only wander to where there are grid squares. There are no entrances or exits to an area, and all buildings are for show: you cannot go inside them. You move to another area by completing all objectives in the current area, and talking to Holy Avatar (who can only be talked to at specific times) and he will whisk you away back to town or to the next area. You can never return to town to buy more potions or heal during a mission, only before or after a mission. However, wandering in specific areas of a map can net you a treasure chest, or the valuable 1-up mushroom – you have to defeat a hidden green mushroom to claim it, and when the hero dies a 1-up is used up instead of seeing the game over screen. And yes, it does make the instantly recognizable Super Mario sound when you get it. You can also find treasure on the corpses of your opponents. Not only is this game fairly linear, but there is a fair amount of area reuse, and some enemy reuse. Now the game does poke fun at itself by helping you point out this fact. For example, when it comes to enemy reuse, it shows you the mushrooms, and that the slightly larger mushroom is the \'Elite\' mushroom, which is much tougher. It\'s honestly not that bad when it comes to enemy reuse, and certainly no worse than other games in the genre where palette swaps are common, but there are a few cases where it does happen. Area reuse is much more common. As I alluded to before, this game makes fun of itself here, and the character dialog makes it a humorous moment indeed. For example, a character in a quest has you go to the famed Crystal Cave and clean it out of giant spiders. A few quests later, you are asked to go to a cave of crystals. After a lengthy discussion about how the cave of crystals is not the same place as the Crystal Cave, you arrive to... the same cave. Even the same treasure chests are still open, and yet the enemies are different. Drake even laments that in the Crystal Cave we fought here, but we\'re in the cave of crystals. It\'s silly, done well, and highlights a common tactic by game designers to reuse areas. Some areas are reused at least three times, and even then the game is faithful to have the characters irreverently make light of it. There are also only a very small number of non-player characters (NPCs); probably only a dozen of these are friendly characters that you can talk to in the whole game. A few enemies also have complex conversation arcs. Player characters do have a fair amount of discussion between themselves, though. Honestly, character development of each of the player characters is pretty well done, and you grow to like many of them. The major downside in my mind is that the conversations in the town (Wish is the only one you return to) rarely changes once you finish their story arcs. It\'s a missed opportunity for even more character development. Despite all of this simplicity, I found it a fun and streamlined SRPG experience. It has only the basics, yes, and it only lasted 14 hours for me, but it\'s fun to play. The art is just beautiful. It\'s extremely well done, with lots of bright colors and lighting. Graphically it\'s a joy to behold. The only thing that struck me as odd is that despite telling the game to enable v-sync, I still saw occasional tearing. It could be a game bug or an ATI driver bug; it\'s hard to say. Otherwise it was a very visually pleasant game to play: effects and animations are very convincing, and when the characters miss their targets, they have funny animations showing their fumbles. The most memorable is when West misses his opponent, he loses the head of his ax: it flies straight up into the air, lands on his foot, and he hops around comforting his toes. Each character animation has equal grandeur and silliness, and they are all very well done. The music is also very pleasant. I always found myself turning it up, and even my wife commented on how great the music was while I was playing. Sound effects, like the graphics, are quite convincing and enjoyable. Creating great atmosphere through graphics and sound makes a big difference on how much I enjoy a game and this one does not disappoint. Apparently the German version has voice acting, but there is none for the English release, even if you choose the German language. Despite all that this game is, both good and bad, there is one area of considerable concern, and that is in Christian appropriateness. This game takes the \'low road\' for much of its humor. While I acknowledge that many of the things that this game makes fun of are exaggerated from the genre – a parody if you will - that doesn\'t excuse what it is. Every woman in this game wears skimpy clothes. The starting outfit for the maidens is called \'a trace of cloth\'. The priestess Angelina wears very revealing clothing as well, including an extremely short skirt, and ironically the vampire Solithaire wears arguably the least revealing but still very curvy corsets. There is also one point in the game where you have to fight the most ugly, fearsome monster, which ends up being some overweight male giant wearing a fairy costume, called a chubby fairy. It\'s definitely unusual (though admittedly funny). In the course of conversation, several of them are loaded with innuendos, with some being rather obvious what the intentions are. When you go to rescue Candy, she exclaims that you must save her or the enemies would shred her dress apart and she would be naked. In another, Angelina comments that the rain is making her clothes wet and transparent. At other times, she offers her fanciful movements and pretty bottom to be distractions for angry or depressed men. Later on, Holy Avatar makes it clear that he intends to \'intensely take care of the maidens\' – all three of them at once. There is one conversation near the end where Angelina invites Drake (the main character) to join her in a bubble bath. The conversation quickly goes into methods of contraception, getting rather explicit into some of the options available for a spell caster like her. Earlier on in the story, it is also made clear that Holy Avatar is a selfish egomaniac who has discarded several other women throughout his life, including one of the NPCs. There is also obvious jealous competition between the three maidens over him. Compared to the sexual content, the other areas of trouble are relatively tame, but still present. There is violence, including humanoids attacking one another. There is no blood or gore. Both your characters and the enemies cast magic. The leader of the \'Dark Church\' calls herself \'Mother of God\'. She also has a pentagram tattoo on her shoulder. One of your characters, Solithaire, is a vampire, and when her obsession meter is full, she will attack a nearby human, including party members, and drink their blood. At one point there is an expectation of the need for an occult ritual, but then the character who asked for the components said he was joking and nothing like that happens. Committing suicide by mushroom is joked about, and there is some language, like \'bulls--t\', \'d--n\', \'hell\', and a few others. This game has crashed to desktop four times for me throughout my play time, and at some point, started popping up an error consistently on start up with a run time error, but hitting okay still starts the game. This still happens even now. Twice I had the game get stuck while in a battle; I had to quit the game and reload. Once while fighting a boss, I found that the battle would end early if all of the remaining opponents were charmed, which could cause problems as the battle would end and I could not progress either with the battle or with the story. There were also several items, character abilities, and enemies that have <text missing> as their description, suggesting a missing value somewhere. Fortunately you can save anywhere and quick save at any time, so most problems can be resolved with a reload. Another thing is that the camera, while it works for the most part, does make mistakes, and zooming in and out with the scroll wheel takes far more work than you might expect. Grotesques Tactics: Evil Heroes Premium Edition is one of those games that, while a fun, short romp, I can\'t recommend because of the many appropriateness issues. While I admit I enjoyed the game, it became a guilty pleasure as more and more appropriateness issues came to light. As a gamer, it\'s fun and I enjoyed it. As a Christian, it has too much wrong with it to recommend. So, please consider the warnings above seriously before buying this game – we need our minds pure from immorality, and I feel that this game goes way too far.